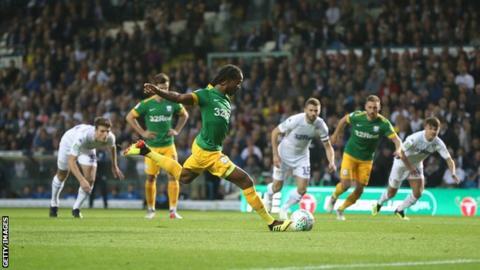 Marcelo Bielsa suffered his first defeat as Leeds United manager, with 10-man Preston North End knocking them out of the Carabao Cup at Elland Road. Daniel Johnson's second-minute penalty had put Preston ahead after Conor Shaughnessy tripped Louis Moult. Ryan Ledson was then given a straight red card for a two-footed challenge on Lewis Baker on the half-hour mark. But Brandon Barker sealed the win with a stunning solo effort on the stroke of half-time. The Championship leaders had made nine changes, with one eye on Friday's league meeting with second-placed Middlesbrough, while there were seven changes for Preston. Leeds did have their chances to equalise after Johnson's early opener, with Pontus Jansson's header cleared off the line and Patrick Bamford denied twice by Chris Maxwell. But Barker's goal settled the game, as he finished a run from his own half with a left-footed shot into the top corner. Leeds failed to threatened much after the break and Preston almost had a third when Johnson's low effort was saved by Jamal Blackman. Match ends, Leeds United 0, Preston North End 2. Second Half ends, Leeds United 0, Preston North End 2. Attempt missed. Pontus Jansson (Leeds United) header from the centre of the box is close, but misses to the right following a set piece situation. Corner, Leeds United. Conceded by Chris Maxwell. Attempt saved. Lewis Baker (Leeds United) left footed shot from the right side of the box is saved in the bottom left corner. Attempt missed. Samuel Sáiz (Leeds United) right footed shot from outside the box is just a bit too high. Attempt missed. Ezgjan Alioski (Leeds United) right footed shot from outside the box is close, but misses the top left corner. Attempt saved. Pontus Jansson (Leeds United) header from the centre of the box is saved in the top right corner. Stuart Dallas (Leeds United) is shown the yellow card. Ben Davies (Preston North End) is shown the yellow card. Corner, Leeds United. Conceded by Ben Pearson. Attempt blocked. Pontus Jansson (Leeds United) right footed shot from the centre of the box is blocked. Attempt missed. Patrick Bamford (Leeds United) left footed shot from outside the box is high and wide to the left. Josh Harrop (Preston North End) is shown the yellow card for a bad foul. Foul by Josh Harrop (Preston North End). Foul by Lewis Baker (Leeds United). Alan Browne (Preston North End) is shown the yellow card for a bad foul. Tom Pearce (Leeds United) wins a free kick on the right wing. Attempt missed. Lewis Baker (Leeds United) left footed shot from outside the box is close, but misses to the left. Josh Harrop (Preston North End) wins a free kick in the attacking half. Attempt saved. Kalvin Phillips (Leeds United) right footed shot from long range on the right is saved in the centre of the goal. Corner, Leeds United. Conceded by Alan Browne. Tom Pearce (Leeds United) wins a free kick in the defensive half. Substitution, Preston North End. Lukas Nmecha replaces Louis Moult. Attempt saved. Josh Harrop (Preston North End) right footed shot from outside the box is saved in the centre of the goal. Attempt missed. Ezgjan Alioski (Leeds United) right footed shot from the right side of the box is close, but misses to the left.